Comprised of two separate volumes, Neuroimaging provides a state-of-the-art review of a broad range of neuroimaging techniques applied to both clinical and research settings. The breadth of the methods covered is matched by the depth of description of the theoretical background. 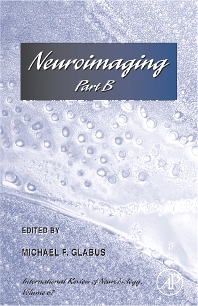 Part B covers the application of neuroimaging in both research and clinical settings for the study of anxiety disorders, dementia, depression, schizophrenia, functional somatic syndromes, stroke, and multiple sclerosis using a range of neuroimaging modalities including CT, PET, SPECT, DTI, structural MRI and fMRI. One chapter is devoted to the study of brain development using structural MRI, and one chapter to the study of pediatric neurobehavioral disorders using fMRI. One of the most exciting recent applications of neuroimaging to the area of genetics is covered, and with the theory and application of neuroreceptor imaging in psychiatry, forms the final two chapters.